It’s all about the kitchen! For years I had to make do with kitchens that had not been updated since the 70s or were so small, you couldn’t swing a cat in (no cats were harmed testing this theory), let alone prepare food or entertain. 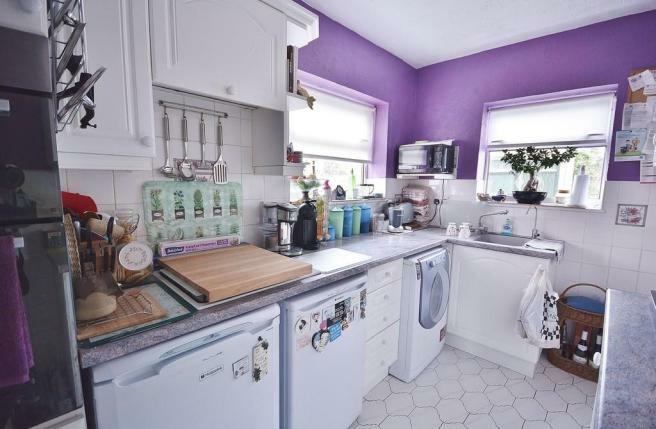 So, when we started looking for a property to buy, the kitchen was THE most important room in the house for me. I knew what I wanted, we moved around a lot whilst my Husband was in the army and had lived in houses that had galley style kitchens, kitchens with a small breakfast bar or enough room to squeeze a small table in. Another dark and characterless Army accommodation kitchen - also before I knew how to take photos! Lots of worktop space. I’m a messy cook and needed the room to spread out all my ingredients! Plenty of cupboard space. We moved every 1 to 2 years and every time we packed up, I’d find about 10 tins of tuna shoved in the deepest darkest part of a corner cupboard as we’d normally only have one cupboard to fit all the food in! The Range cooker! I had romantic visions of a big Christmas dinner with all the family over and a range to cook all the food. When we were designing the kitchen with Howdens, the designer laughed and said, you’d be surprised how many people design their kitchen around Christmas! Bi-fold doors was the absolute dream! Many of our previous kitchens looked out over the main street and I was forever hearing the kids playing (fighting) in the garden and couldn’t see what they were up to. It was paramount that I could look out over the garden whilst preparing dinner. Lighting. 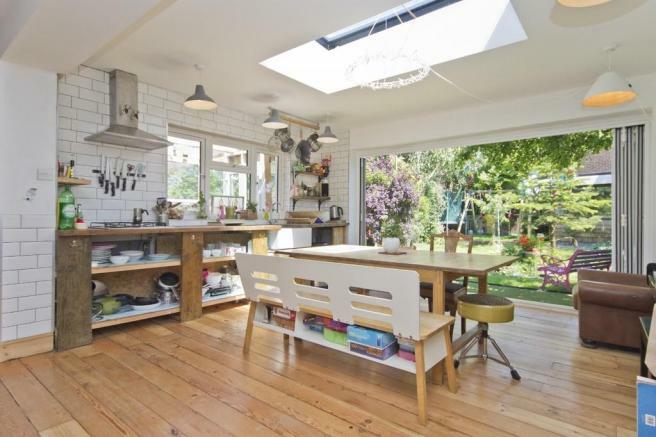 This is often overlooked, but I wanted a kitchen that was bright throughout the dark winter months so I didn’t chop my fingers off, but could also be dimmed in the evening when we had friends over. With all of this in mind, we set off to find our perfect house that would cater for them. 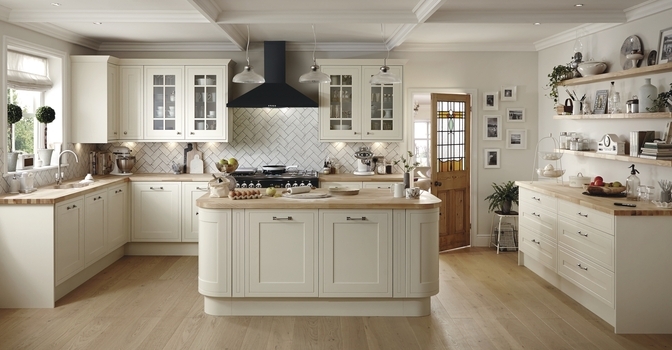 We looked at houses with beautiful kitchens, but often not to my taste which would mean changing the units or redecorating. But this was something I really didn’t want to do as we would be spending more money but not actually seeing a bigger return on the house. So in the end, we only looked at houses that needed renovating. We initially put an offer in on a house that had the space, but the layout for me was all wrong. It had a galley style kitchen and three reception rooms, which just didn’t work. The kitchen is by far the most used room in the house in my eyes, but it was no wider than 2 metres! We would have needed to knock down walls and create a bigger kitchen diner, with the potential of extending out the back, but I could see the potential. But, 4 weeks into the buying process, our house came on the market and as soon as I saw it on Right Move (does anyone else continue to torture themselves by looking at properties, even after they’ve put an offer in/bought?!?) I knew I had to go and view it. 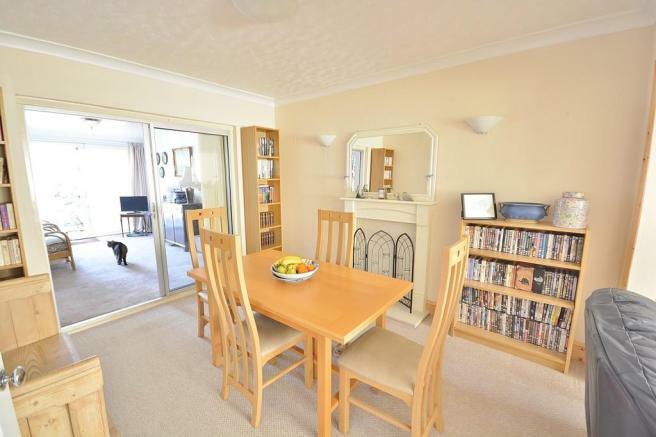 It had the huge kitchen diner with bifolds already in place and 5/6 bedrooms, plus it needed full renovation and was on the market for the same price as the one we were currently buying. I put an offer in there and then and it was accepted. Once we had moved in, we hired builders and started looking for a kitchen. We had designers from Howdens, Wickes and Wren and visited Ikea to get some ideas and the best piece of advice I can give is always, ALWAYS get several quotes. Wickes were by far the cheapest, but their customer service was appalling (the designer told us the room was not big enough for an island. It’s 25ft x 17ft, enough room to swing an elephant!! They also didn’t deliver the quote when they said they would, resulting in lots of phone calls and delay tactics). Howdens were more expensive, but their customer service team were superb, they listened to everything I requested and completely delivered. The kitchen was with us the following week! The builders turned up 3 months after we had moved in and having to deal with a kitchen where the 2.5 metre long units and worktops were made of scaffolding boards, no cupboards or drawers to throw crap in and my dishwasher outside in the extremely leaky lean to, I could have kissed them! They started ripping out the old kitchen straight away and with my piss poor planning skills, I was left wandering how on earth I was going to cook dinner that night? Thankfully we have a utility room and I turned this into a makeshift kitchen whilst the renovations were going on. One of the first big jobs was to take out the wood burner and structurally prepare the chimney breast for the Range cooker to go in, which is still one of my favourite features of the kitchen! Plastered and good to go! 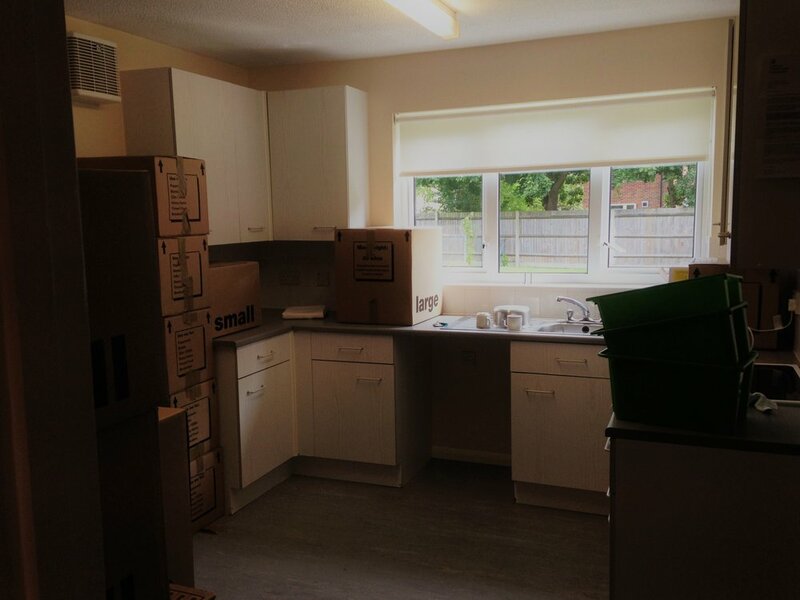 It was fascinating to see the kitchen units come to life and the room take shape, all to the soundtrack of loud dance music and a constant aroma of McDonald’s. We went with the Burford white kitchen from Howdens with a solid oak top and the main reason for this being, I loved the curved units (ideal when you’ve got 2 small rugrats charging about) and it was their most popular range. Why would I want the same as everyone else you might ask? This house for us was always a doer upper and even though I dreamed of the dark blue units with marble top, it made sense to go with a kitchen that would appeal to the masses! After spending months on Pinterest, I really liked the look of white metro tiles, so our builders ordered these and started to put them up around the range cooker. But as they took shape, I felt totally uninspired by them. The whole kitchen was very monochrome and it needed an injection of colour and pattern, which is why I chose the grey Victorian style tiles from a local Brighton tile shop. Thankfully, everyone agreed they transformed the space and gave it far more character, even if the builders were cursing me as they chiselled off the old tiles! Pretty much 8 weeks to the day the builders started, they packed their equipment and said a final farewell and left me in peace and quiet (for about 5 minutes before the kids kicked off) to contemplate how the rest of the room was going to take shape. We already had a dining table in place and I wanted a corner sofa which looked out through the bifolds over the garden. It was a complete blank canvas, waiting for an injection of colour and character and my head was brimming with ideas. All in all, the experience was thoroughly enjoyable, helped by the fact that our builders were amazing, a pleasure to have in the house and we had an excuse to eat out (nearly) every night! Can’t wait for the next project! Our peninsula. We went for a U shaped kitchen after being told there wasn't enough room for an island! Entertaining, cooking and being able to watch the kids as they play in the garden! All my kitchen "musts" met! Enter your email address to subscribe and get the latest blog posts direct to your mailbox!